Supporters of Hillary Clinton not only disagree with the left on the issues, but also try to deny the legitimacy of disagreement. They have tried to dismiss opposition to her views and conduct as sexist or right wing (even when they are supporting the more conservative candidate). More recently we have seen a form of McCarthyism from Clinton supporters and the Democratic establishment, as they have tried to make a case that opposition to Clinton, and support for Bernie Sanders, is based upon Russian propaganda. 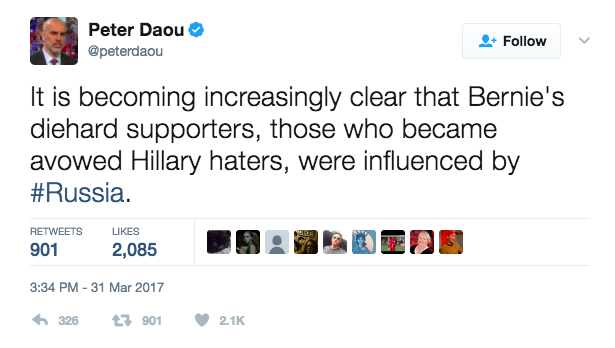 As seen above, this includes Peter Daou, a long-time practitioner of dirty politics for Team Clinton, who previously found ways to blame everything on sexism. There many areas of disagreement between the left and Clinton, as I discussed in the previous post. As I noted, Clinton’s record on corporate influence on public policy received the most publicity during the campaign, as this is what Sanders concentrated on, but those who opposed Clinton also disagreed with her on many other issues, including foreign policy and interventionism, civil liberties, many social/cultural issues, the drug war, and health care (especially with Clinton attacking Medicare for All with bogus claims). These issues have nothing to do with support for Putin or any fake news from Russia. Clintonistas are even less tolerant of opposition to their neoconservative views than Bush supporters were. Some 13.2 million people voted for Sanders during the primary season last year. What percentage does any rational person really believe voted that way because of “fake news”? I would guess the number is infinitesimal at best. The Sanders campaign was driven by a lot of factors, but mainly by long-developing discontent within the Democratic Party and enthusiasm for Sanders himself. To describe Sanders followers as unwitting dupes who departed the true DNC faith because of evil Russian propaganda is both insulting and ridiculous. It’s also a testimony to the remarkable capacity for self-deception within the leadership of the Democratic Party. If the party’s leaders really believe that Russian intervention is anywhere in the top 100 list of reasons why some 155 million eligible voters (out of 231 million) chose not to pull a lever for Hillary Clinton last year, they’re farther along down the Purity of Essence nut-hole than Mark Warner. Moreover, even those who detest Trump with every fiber of their being must see the dangerous endgame implicit in this entire line of thinking. If the Democrats succeed in spreading the idea that straying from the DNC-approved candidate – in either the past or the future – is/was an act of “unwitting” cooperation with the evil Putin regime, then the entire idea of legitimate dissent is going to be in trouble. Imagine it’s four years from now (if indeed that’s when we have our next election). A Democratic candidate stands before the stump, and announces that a consortium of intelligence experts has concluded that Putin is backing the hippie/anti-war/anti-corporate opposition candidate. Or, even better: that same candidate reminds us “what happened last time” when people decided to vote their consciences during primary season. It will be argued, in seriousness, that true Americans will owe their votes to the non-Putin candidate. It would be a shock if some version of this didn’t become an effective political trope going forward. Posted in Bernie Sanders, Hillary Clinton. Tags: Bernie Sanders, Hillary Clinton, Peter Daou, Russia, Vladimir Putin. RSS feed for comments on this post.. TrackBack URL. You are an idiot sir . Look at clintons record . Compare it to Sanders. She embodies Neoliberalism, it's a cancer that must be cut from the body of our government. Wealthy Elites, corporations and big Banks pouring a never ending supply of dark money influence into BOTH parties have absolutely no business doing so. Them and all who take said money's operate in their interests and serve only Power and profit, Greed is their modus operandi. Progressives are in the midst of an all out war to get their influence out of our government, elections, judicial system ect. We must kill citizens United, we must fix our electoral process. We must break up the monopoly on our Mass media and demand a return of true investigative journalism and journalistic integrity. We must overhaul our justice system. We must kill the new incarnation of the Patriot act and restore our constitutional rights. We cannot tollorate a two tiered system of justice. One for the average American and another for the wealthy and well connected. These aren't radical things. These issues are what this country was founded upon. All Americans should have a vested intrest in fixing this mess together. As for Sanders supporters we were Alienated , silenced and disenfranchised by the Democratic party. Shultz had to step down because she was caught being an unfair Arbiter, then was replaced by Donna Brazil who was also caught bring an unfair Arbiter feeding debate questions to Clinton . Reflect on Trey Gowdy questioning James Comey, it was established Clinton destroyed top secret information months after it was subpoenaed and lied to the FBI repeatedly. By law it bans her from holding any political office indefinitely. Aside from all the above progressives were petrified of her passing the TPP which there was no exit clause. I could keep going but it sure as hell wasn't Russia that kept over 8 million people who voted for Obama that didn't turn out to back such a corrupt candidate with three ongoing criminal FBI investigations. If you want a reason she utterly lost , look no further than your dear leader clinton. Please stop drinking the Kool-aid. Help fix this mess together. I have never had as much utter loathing of a political party as I do now of the Clintons and their DNC. I have friends who have fallen for the bogus feminism and tell me to shut up. They accuse me of being the hater. And worst of all, they call the Clintons' (and Obama’s) choice of Wasserman Schultz, a former chair of a previous Clinton campaign to be in charge of last years’ nomination apparatus “strategy.” I don’t know these people any more….they seemed nice enough and bright enough, but somehow they have been hypnotized and had any sense of decency and humility removed by associating with the Clinton myth of victimization. Chris, I hope that in clearly addressing this to the graphic of Peter Daou’s tweet, you realize that I (as author of the post) am on your side. I almost stopped reading your comment after the first sentence until I saw where you were going. That is common from Clinton supporters. They do not allow for people to disagree with them, or to honestly object to Clinton’s action. To them, one cannot disagree without being a “hater,” along with being sexist, of course. Now add Russian-dupe to that, in their deranged minds. How do you lose to Donald Trump. Seriously? How? Look in the mirror DNC. The fault lies with you and your disconnect with your base. We are tired of your interest in money, power and politics instead of serving the people, the disappearing middle class. How is it, all of the superdelegates were locked and loaded so far in advance of the convention? You folks drinking from the same pig trough must think we are so stupid. The people spoke. Democrats have a higher expectation of morality and integrity than the DNC offered. Time to sweep the house clean. I have not, and will not, give any money until he DNC until that changes. Despite all the fundraising the DNC touts, you will never win elections until you cast aside your current ways and reconnect with your base. I am so done with you and I am not alone. Lorraine Zaloom– It was Clinton's election to lose and she went about that task with great efficiency and dispatch. She told half the party, many of whom only registered Dem because of #Bernie, that we were not only not needed but unwanted as well. Her campaign was not about defeating the "crazy-pants" opponent, it was about securing neo-liberalism in the Democratic party. You cannot defeat a neo-con opponent by saying "at least I'm not HIM!" Voter apathy is a direct result of no real choice in candidates. Spot on Ronald. The party still clinging to its ways.